I love shopping…who doesn’t? 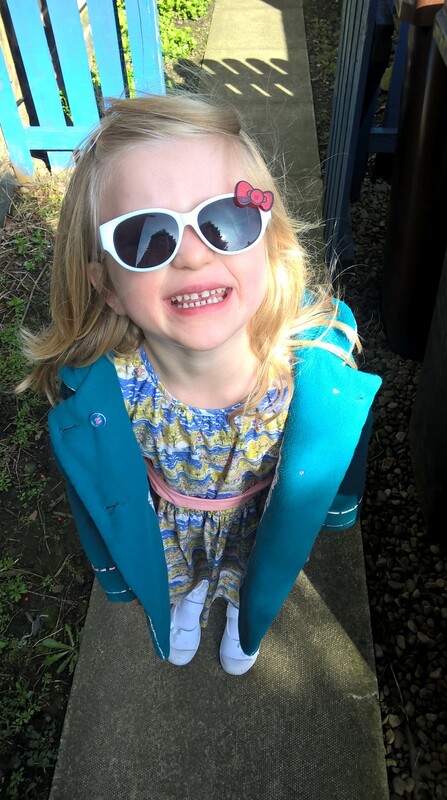 But when you are living to a budget kids clothes aren’t always a priority of where the money should be spent, especially when you can buy nearly new on ebay, in charity shops and now its spring…car boot sales (Get in)! I know if I had a few extra pounds, exactly what bits I would want to go buy for both Megs and E, but I also do not see them as essential buys when they are just 3 & 5. They wear lovely things and have a range from smart Sunday best right down to play clothes for each season and this is made up of a mix from the charity shops and car boots, hand me downs and then the odd new thing to freshen up their looks, and when I look at them everyday I am really happy with this balance we have as it doesn’t stress me out if they are ruining clothes and it doesn’t break the bank. One of my favourite phrases as a thrifty woman is when people say to me “oh I have a bag of stuff for ….. if you want to look through it?” ! And some have even began with “I hope your not offended but I have….” Offended??? I LOVE second hand stuff that can be put to good use, I love that we can recycle it, I love that it saves me money and I love that they can get it off their hands… What really is there to be offended about? New clothes are new to kids whether they came from a shop or out of a bag from a friend or cousin! I again heard the sweet reference of hand me downs this week when one of my friends text and asked if I was ready to rummage through her baby stash yet that she has been hoarding for me for the past 6 months. I have been touched by her thoughtfulness to hang onto it until I was ready and that she was kind enough to offer to me these things for our baby… As I have been in denial of how much I needed and thought 4 baby grows was ample, I said I was indeed ready and wanted to look anyway before I headed to shops to face the overwhelming challenge of choosing things and perhaps spending unnecessary pounds. So after the school run on Tuesday I spent the morning at her house sorting through bag fulls of baby attire into sizes and then from those piles, choosing what I wanted to take for baby Smith. There were so many lovely and useful things from vests and baby grows to cute dresses and outfits. Most of it pattern and colour wise is everything I would have turned my nose up 3 months ago, but my style for this baby has drastically changed to softer pinks and pastels and more florals and I am in love with how lovely they are for her! (AHHHHHHHH what is happening?). I only took NB and 0-3 as I felt anything older would be too much. This was not only a fun morning, but it has save me a lot of pounds, time and personal awkwardness of going into baby shops and making decisions. I know that Second hand isn’t for everyone, but for me with each baby there has always been someone handing something down and it has been such a money saver and blessing. I love hand me downs and will always have a look when friends and family offer as you never know what treasures you may find for your kids to wear. Pass on stuff you’re done with and graciously receive when its offered. It saves money, makes life easier and really is exciting to get new to you things for the kiddos!